Work less & make more money - is that really possible? Work less & make more money – is that really possible? I didn’t realize it until today as I was updating a couple of pricing posts, but this will be the 41st article I’ve written on pricing in the last few years. If you’ve never read any of them, you may want to check them out. Some have focused on product pricing, others on service and freelancer pricing. Some have dealt with pricing in an ecosystem (like WordPress themes or plugins) and others have been pricing tips from current research. I guess you can say I find the topic of pricing fascinating. The other day I read a tweet from a trusted friend who called “value-based pricing” a toxic buzzword. I understand it. Most people define and treat value-based pricing wrong. So I completely understand it. In fact, it’s why I created this video to explain what value-based pricing isn’t. But that is why the topic is so fascinating. It pushes people to challenge their assumptions. It challenges what we think we know about how people make decisions, and more. And I get why, when you’re just starting out, the focus is on hustle and drive – just to win a couple of clients. For the last 21 years I’ve worked in other people’s companies while doing some side work as a coach or consultant. Less than a month ago I left that last job and created some space so I could evaluate several alternatives. One of those was working alone, on my own, doing more of what I’ve done on the side. Right away, you’re faced, the moment you create that first proposal, with a core question. What will you charge? I was on a clarity call with someone yesterday who wanted help setting up their Rainmaker site. They wanted a lead for who could help hold their hand as they got their site up and running. And in that moment, I realized that while I might charge a lot of money for that, someone else might charge 10 times less than I would (it’s also why I recommended someone else). As I’ve said before, it’s all a function of perspective. Are you looking inward to what you think you’re worth (driving a bit of insecurity)? Or are you looking outward at the client and their perception of what you’re doing? To that caller, what I was talking about was hard, complex and nothing about it would be self-evident. To me, it looked fast, easy and totally obvious. Does this mean you can work less and make more? The reality of the situation is that I think a lot of people could actually work less and make more. I think that’s possible. Even though I also think that if you’re young, working less and making more is the wrong goal. I’ve written about it before, but when you’re young, my general advice is to work as hard and as long as you can because of the downstream dividends it pays later. But few young people (even myself when I was younger) fully grasp that dynamic. But the how is what you want, right? How do you work less and make more? One of the answers is that you have to raise your rates. And underneath that reality lies so many nuanced challenges that it often feels frustrating to simply hear, “raise your rates.” After all, you might price yourself out of the market. I’ve seen this happen. So it’s not just “raise your rates.” It also requires a bit of structure and strategy. Thankfully, however, it’s all possible and this information is available to you – in terms of how to do it. 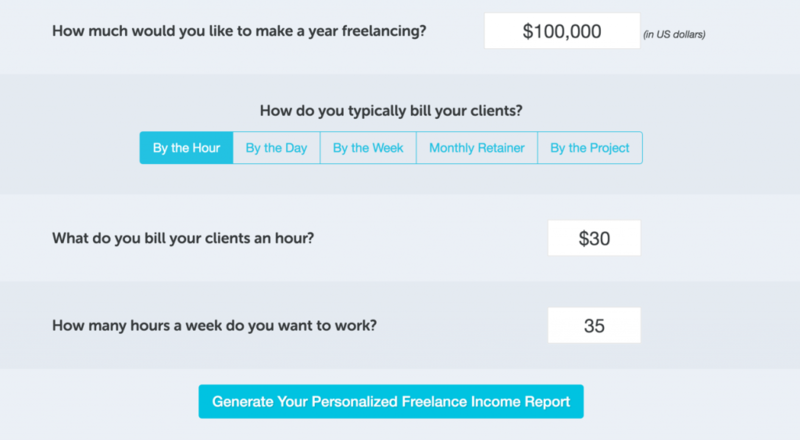 My friend has created a super cool freelance calculator to help you look at your rates. And then he’s created a free pricing course to help you raise your rates. All so you can work less (if you want to) and make more.